Yeroc, J.M.A. Gregson, January 2000, lot 6; with 2017 R.P.S.L. certificate. Scott No. 13. Campbell Paterson No. A3a. SG No. 40P Estimate $3,000 - 4,000. AN EXCEPTIONALLY RARE 3D DIE PROOF IN BLACK. 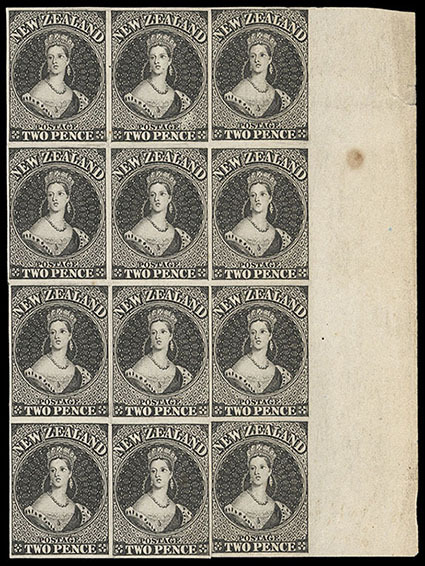 New Zealand, 1855, Queen Victoria "Chalon Head", 1d black, plate proof on wove paper, unwatermarked, full margins including sheet margin at left despite the haphazard laying-down of the plates, note the irregular spacing between impressions in both rows and columns, all impressions have a leftward slant, couple small flaws incl. some minor creasing, Very Fine. Scott No. 1P. Campbell Paterson No. A1c. SG No. 1P Estimate $3,000 - 4,000. THE LARGEST RECORDED INTACT PROOF BLOCK OF THE 1D VALUE, HAVING BEEN REMOVED FROM A LARGER BLOCK OF 82 STAMPS. The 1d, 2d and 1sh stamps were official ordered from Perkins,Bacon & Co. of London on March 5, 1853. The dies and plates were produced in 1854 and shipped to New Zealand along with printing supplies on September 28, 1854. At least one proof sheet from each plate was printed on medium white wove unwatermarked paper. They are easily distinguished from later reprints, often on card, by the sharpness of the impression and absence of plate wear. The 1d value had 10 of the 240 plate impressions re-entered, more than any of the other denominations. New Zealand, 1855, Queen Victoria "Chalon Head", 2d black, plate proof on wove paper, unwatermarked, full margins including large sheet margin at right, compared to the 1d plate, the impressions are oriented vertically but spacing between the impressions is variable, couple small flaws including stain spot in margin, Very Fine. Scott No. 2P. Campbell Paterson No. A2b. SG No. 2P Estimate $1,000 - 1,500. 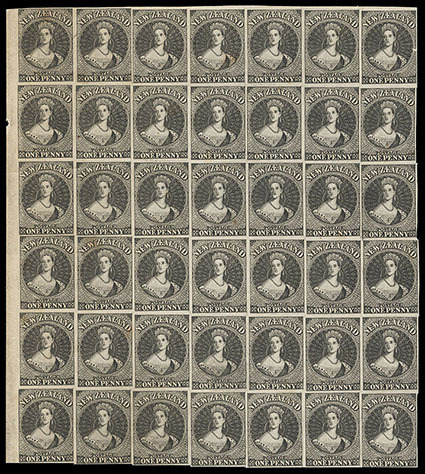 A RARE LARGE PROOF BLOCK OF THE 2D VALUE, HAVING BEEN REMOVED FROM A LARGER BLOCK OF 48 STAMPS. There is a weakness in the background above "PENCE" for position 15/11 that is seen on the printed stamps. Many of the vertical frame lines are weak, eg. 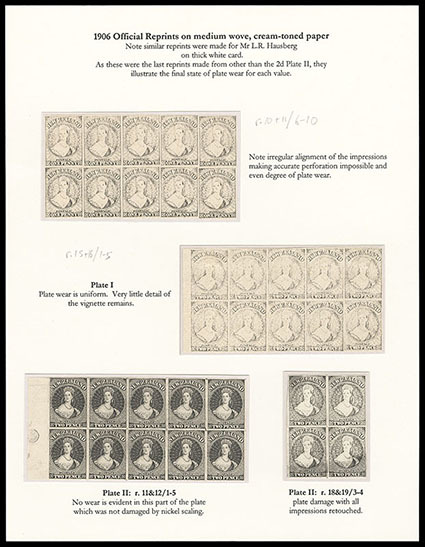 the left line on position 18/12 and required required recutting and strengthening between printing of the plate proof sheet and the actual stamps. Three re-entries and two positions with flaws are recorded. New Zealand, 1855, Queen Victoria "Chalon Head", 1s black, plate proof on wove paper, unwatermarked, full margins including sheet margin at bottom and sides, some minor creasing, Very Fine and rare. Scott No. 3P. Campbell Paterson No. A6b. SG No. 3P Estimate $2,000 - 3,000. PROBABLY THE LARGEST RECORDED INTACT PROOF BLOCK OF THE 1SH VALUE, HAVING BEEN REMOVED FROM A LARGER BLOCK OF 60 STAMPS. The impressions on this block are much more accurately laid down than on the 1d and 2d plates. Row 1/5 is the only re-entered position. A small area of weakness in the spandrels below the Queen's shoulder on the left is present in all positions and is a defect on the die. 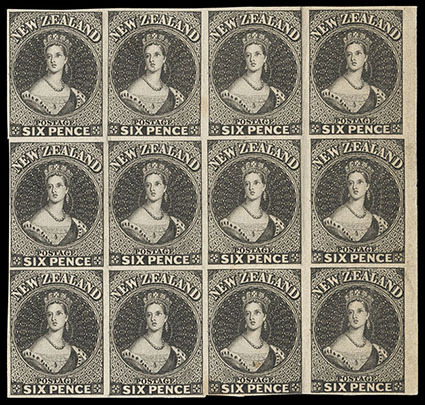 New Zealand, 1859, Queen Victoria "Chalon Head", 6d black, plate proof on wove paper, unwatermarked, right margin block of 12 (R. 5-7/9-12), full to large margins except clear at bottom, Very Fine and rare plate proof multiple, Yeroc, J.M.A. Gregson, January 2000, lot 8. Scott No. 9eP. Campbell Paterson No. A5. SG No. 12P Estimate $1,000 - 1,500. The 6d plate was ordered in 1858 to provide a stamp to prepay postage on letters to the United Kingdom from March 27th 1857. For almost 2 years, the 6d rate was paid by strips of three of the 2d stamp. The premium route "Via Marseilles" required an additional 1d and 2d stamps (9d for ¼ oz. letter). Paul Kruger, Schuyler Rumsey, April 2018, Lot 286. Scott No. 32a. Campbell Paterson No. A2m. SG No. 113P Estimate $1,000 - 1,500. In 1864, Davies printed a sheet of the 2d from plate I which he sent to Perkins, Bacon with a request for a new plate. New Zealand, 1902-1929, Reprinted Die Proofs by Perkins Bacon & Co., collection of 38 proofs comprising types (a) in seven different colors (b) in six different colors (c) with serpiginous line and dots, in five different colors (d) with serpiginous line and dashes, in four different colors (e) printed for the Herts Philatelic Society (Jun. 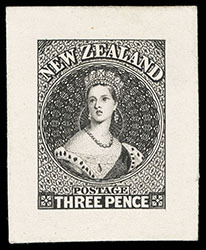 4th 1907) in five different colors; and the 1950 dies printed for the Royal of N.Z. in six different colors, Very Fine and attractive group, Marcel Stanley, Christies Robson Lowe, December 1992, lot 383. These proofs were trade samples printed by Perkins, Bacon & Co. from a rejected roller die for the 1d value that was retained by them. The original working des had been sent to New Zealand in the 1860s. 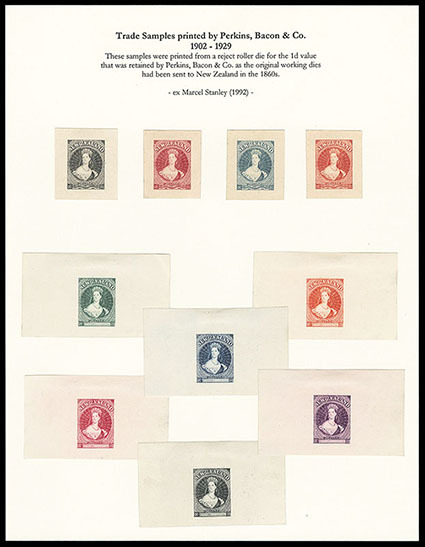 New Zealand, 1906 1d-1s Official Reprints, black on medium wove creamy paper, collection group including plated blocks of ten comprising 1d, 2d plates I and II, 4d, 6d and 1s, blocks of four of 2d plate II, 6d (2) and 1s, plus a 1d-1s set of singles; also includes a set of Hausberg 1d-1s pairs, Very Fine collection.